Yeah another redesign. When the Galaxy S8 came in 2017, we all loved the new looks and feel, the features added and all sorts of stories surrounding this new year’s release showed that there would likely be another new looking Galaxy S flagship from Samsung. And of course we are ready for this awesome thing yet again. We expect the Samsung Galaxy S10 to be released by the 20th of February 2019 which means in 2 weeks time, we will all be seeing what the device will look like. While pre-sale orders might start immediately, the device is expected to land in stores at least in Europe and US somewhat around March…March 8 2019 to be precise based on Reports we got from Pocket-Lint.com. And the price will start as high as $1034.74 this eprice is based on my direct Google money converter from £799 it will be sold in the UK. The real story is that Samsung already sent out invitations for the launch of it’s Galaxy Unpacked event which will take place in San Francisco on the 20th of February 2019 which is a week just before the MWC (Mobile World Congress). This event is going to specially be for the launching of the Samsung Galaxy S10 device exclusively. While there isn’t an official pricing yet for the S10, we’re yet left with something between $1000 all the way up to $1200 all based on rumors and reports from the likes of Gizmodo, TuttoAndroid and Pocket-lint Online leaker Ishan Agarwal has since claimed the S10 would be priced between €899 and €1149 and the S10+ between €999 and €1499 so exact pricing is currently unknown. Sincerely, this device is going to be expensive and believe it or not, year by year, smartphones will keep getting more expensive as the competitiveness for customer increases as more mid-range smartphones now includes great features which puts the high end premiums on the hook for a forceful improvements. What will the Galaxy S10 will look like? Officially…we don’t know that for sure. But we do know for sure it’s going to be a bezel-less display. Although Samsung had invented the so-called Infinity Display among which is Infinity – V which is a V-Shaped notch on one of it’s smartphone’s display. The flagship is expected to feature the Infinity-O display which is going to be a punch-hole screen just as we’ve seen on the Huawei’s Honor View 20. The new design will feature a very thin bezel that will nearly be invisible just as seen on the Oppo FindX. Also, there were rumors that there would be new colors among which would include a gradient option which we know Huawei and Honor to always feature on their devices. Most of the leaks are supported by big brands and personalities such as Evan Blass and Bloomberg. 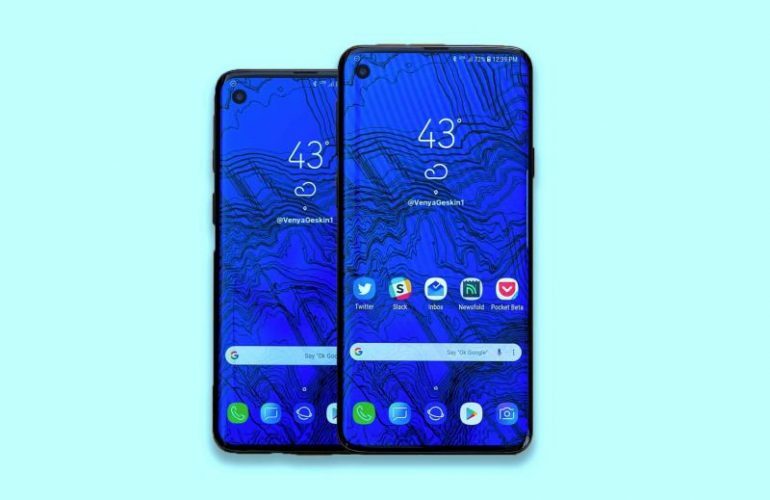 While we’ve seen loads of 3D rendering of the look and feel of the Galaxy S10 due to leaks and rumors online, majority of the rumors centers around the punch-hole on-screen camera display. The inclusion of the camera on the screen of the device is said to be a move to remove the upper area of the device while squeezing larger screen within smaller body frames. Renders from CompareRaja showed there would even be an included Lite Version which will be the cheapest version of the Gakaxy S10. The S10+ Version is expected to have a Dual-Camera lenses on the display which we feel might not be very cool because of how unnecessarily wide the on-screen camera would look and feel like since it’s a punch-hole, it’s expected to reside by the upper corner of the device. Another thing that would be fascinating would be the On-Screen fingerprint sensor which had already been implemented by other brands such as the Vivo and even Oppo. This is definitely a high-end device with top-notch software modules. Bixby, the Samsung’s AI Bot which the company had been training all the way since 2017 is expected to come on-board and it’s expected to feature the latest Android Pie and Google Assistant with Samsung User Experience. Samsung has incrementally moved its software along through recent devices. It’s the most feature-packed and impressive reworking of Android and we don’t think it really needs changing. Certainly there are areas where Samsung is going to continue to expand, like SmartThings and Bixby, as it looks to expand connections to devices around the phone. 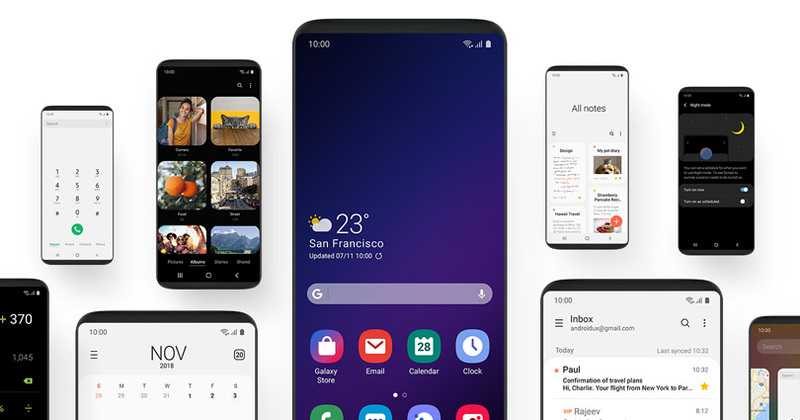 There have been some leaked screenshots of the Android Pie update for the S9 and Note 9 suggesting an overhaul to the Samsung Experience user interface. The shots come from Experience 10 and are taken from a beta build. Assuming they are legitimate, we’d expect to see this interface on the S10 too. The images that recently appeared on 91Mobiles show a refreshed UI with rounded icons matching those seen in the screenshots above, suggesting this will be the new look. We don’t know that for sure but if we’re to use statistics, we would be rewinding back to 2017 and 2018 to see how Samsung utilized multiple cameras on it’s Galaxy S8+ and S9+. This same could be possible with the S10+ even to the extent of making those cameras triple or quadruple. I’t no news that other companies such as Huawei have implemented something like this on it’s devices such as the Huawei P20 Pro for example or even the recent Honor View 20. Based on rumored reports from Evan Blass, he claimed that there wold likely be three cameras behind the higher variant of the device but will be made up of a standard lens, wide angle lens and telephoto lens; the he also says these are “preliminary details”. Ice Universe also claims the S10 and S10+ will have three cameras on the rear though. But what we know is that the Galaxy S10 will be a massively different camera smartphone quite different from those Samsung Galaxy we’ve seen in recent times. Even CompareRaja and 91Mobiles renders suggested the possibilities of 5 cameras on the Galaxy S10+. An image tweeted by Evan Blass showing the S10 and S10+ encased supports this too with the S10 showing a single front camera and triple rear camera and the S10+ showing a dual front camera and triple rear camera and its what we’ve seen in all the latest press renders too. But all we know is that the look and feel and even the pricing of the next Samsung Galaxy S10 is going to be different maybe sleek or ugly, but one thing for sure is that it’s definitely going to be expensive…Like it or not. It’s even going to have a really crazy camera feature that will set it apart from the previous version and this alone might make it a really cool device worth purchasing. Battery-wise, we hope it doesn’t explode yet, packed with cool battery that could last long through the day. Time will tell and we’ll see what Samsung has for us while we keep our fingers crossed for the next big thing from the Korean Brand.